um Jubiläum des Cyberpunk-Rollenspiels Shadowrun veröffentlicht Catalyst, der englischsprachige Lizenznehmer eine Anniversary Edition des Grundregelwerks. Die Anniversary Version wird voll kompatibel zu allen 4E Quellenbänden sein, Spieler werden also nicht bangen müssen das alte Material nicht gebrauchen zu können. Laut Verlag ist alles aufgeräumter und übersichtlicher und der Master Index inklusive Verweisen auf Street Magic, Unwired, Augmentation, Runner’s Companion und Arsenal ist auch dabei. Wenn du ganz neugierig bist kannst du dir auch schon zwei Previews ansehen. Einmal aus dem Skills Chapter und einmal aus dem angesprochenen Master Index . Deutsche Spieler brauchen aber nicht traurig sein denn dieses Ausgabe ist auch die Grundlage für das neue deutsch Shadowrun 4 Grundregelwerk von Pegasus . FASA Corporation launched what would become one of the best selling RPGs of all time in 1989. While building off of the blocks laid by the emerging dystopian future-cyperpunk genre, Shadowrun took a very different route by slamming that concept head-on into traditional fantasy elements of dragons, magic and fairy folk. 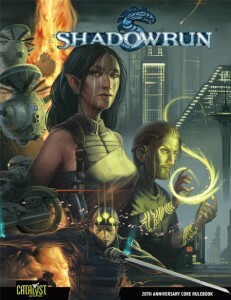 To celebrate 20 years of this seminal RPG, Catalyst Game Labs is pleased to announce the Shadowrun, Fourth Edition 20th Anniversary Core Rulebook, which includes a host of upgrades for any Shadowrun player. 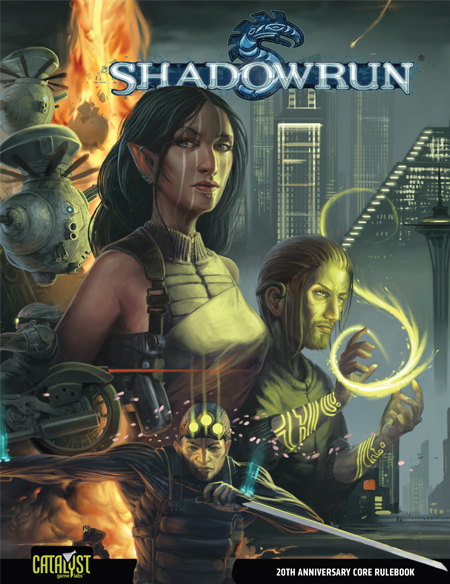 A cover-to-cover full-color treatment allows for a stunning presentation of all the visuals Shadowrun has to offer. While fully compatible with all Fourth Edition-published books, much of the information has been re-presented for better usability. To make this the ultimate core rulebook resource for the entire Shadowrun game line, a 22 page Master Index has been generated and included, covering the 20th Anniversary Edition, as well as the following core rules expansions: Arsenal, Augmentation, Runner’s Companion, Street Magic, and Unwired. Never has a core rulebook been so fully meshed with its full line of expansion rulebooks; check out the PDF previews of all this great book has to offer! A deluxe, 4-panel hard-cardboard GM screen featuring a stunning full-panoramic illustration of Seattle. A 32-page booklet of additional sample contacts and adventure seeds. On The Run, a 56-page „first run“. Anatomy of a Shadowrun, a fictional account of a shadowrun, annotated with how game rules apply to the fictional run; a perfect „first-time-player“ companion. Big Book of Tables, a 64-page booklet drawn from Shadowrun Fourth Edition as well as all five core rules expansions for an easy-to-use guide when trying to equip your characters with the latest and greatest during character creation. The Pre-generated Auxiliary Character and Kit System (PACKS) allows players and gamemaster’s alike to quickly assemble player and non-player characters using plug-and-play character profiles and equipment kits. 6 heavy cardstock, double-sided reference sheets provide quick and easy reference for a variety of tasks, from how to resolve combat, to hacking, to summoning and more. And that’s just the beginning. Other 20th Anniversary projects, along with a full line of supporting Shadowrun books, will release throughout the year. Look here for more announcements in the future!